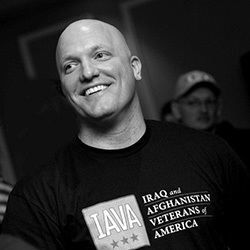 In 2004 Paul Rieckhoff founded the Iraq and Afghanistan Veterans of America. IAVA has grown to over 200,000 members. Paul, now 36, talked to us about his journey from the battlefield to innovating in the advocacy space. Paul Rieckhoff enlisted in the U.S. Army Reserves in 1998, and shortly thereafter went to work on Wall Street. When 9/11 struck, he rushed to the scene to volunteer–and was then called to formal service as a member of the National Guard. Then in 2003, Paul deployed to Iraq. When he returned, he wanted to represent the voices of the more than 2 million veterans of the wars in Afghanistan and Iraq. So in 2004 he founded Iraq and Afghanistan Veterans of America (IAVA). In just a few years, IAVA has grown to over 200,000 members hailing from all 50 states. IAVA advocates on behalf of their members on a range of issues from PTSD to homelessness and from the recent Don’t Ask, Don’t Tell bill to the New GI Bill. Paul wrote an acclaimed book about his experiences, and was named by GQ as one of the 50 Most Powerful People in D.C. He’s appeared on television programs from Bill Maher and Rachel Maddow to Dr. Phil and Charlie Rose. He has become so respected that he was mentioned as potential candidate for Veteran’s Affairs Secretary in 2008. Paul, now 36, talked to us about his journey from the battlefield to innovating in the military and advocacy space. To build a new veterans’ movement supporting this next greatest generation of veterans and their families. When I came back from Iraq in 2004 the first thing that hit me was the huge disconnect between our troops and the rest of the country. Our military was at war, but America was at the mall. Over 2.2 million vets had served in Iraq and Afghanistan but their voices weren’t being represented in the national dialogue. I wanted people to start listening to us. Above all, I wanted this country to support the troops I served with and their families better. I didn’t want my guys to be treated like our Vietnam vets were when they came home, so I decided to do something about it–and organize. That first year back, I put all my energy into building a next-generation movement for fellow veterans–a community that would welcome them home, listen to them, support them and open up new leadership opportunities to them after their military service ended. IAVA is the culmination of that idea. What was the inspiration for IAVA? I didn’t have to look far for inspiration–it found me. When I moved back to New York City after Iraq, I met some Iraq veterans who were struggling to pay rent and put food on the table for their kids. I also met vets who were having a hard time at Walter Reed, and vets who were homeless and living in the shelter with their kids. These men and women had served our country on the frontlines, and suddenly they were slipping through the cracks at home because no one was paying any attention. Too many of them couldn’t find a job or just get in to see a VA counselor for Post-Traumatic Stress Disorder. What I was seeing should have outraged the entire country. I knew then we had to act to wake the country up to this reality. These brave men and women are our country’s best. They inspire me each and every day. There were a lot of issues to tackle at the start from the lack of body armor for troops’ to homelessness and flaws in the GI Bill. The transitional issues were and still are constantly evolving for this generation of veterans. Our top priority was to get them all the resources and support they needed for a seamless transition home. We started first by tackling the GI Bill because we noticed from the beginning was that almost every new vet had a tremendous desire to continue serving after military life. We knew we not only had to help them get back on their feet after deployment, but also help them translate the leadership skills they learned in the military into other fields and careers where they could serve the country. After World War II, the GI Bill was a promise this country made to veterans like my grandfather–that those who defend our country should be able to take advantage of America’s opportunity. But too many Iraq and Afghanistan vets were coming home to find it outdated. So for two years, we worked our asses off. We talked in the media, we organized online, and we walked the halls of Congress with fellow vets talking to our senators and representatives about getting a New GI Bill passed. At the time, the financial crisis was looming and a lot of vets were coming back from deployments to a worsening job market. But we owed them all a chance to go to school to get the education and skills needed to make their way successfully into the civilian workforce. In 2008, we finally helped shepherd the Post-9/11 GI Bill to the President’s desk with broad bipartisan support in Congress. It was a pivotal moment–one that could change the entire course for this new generation of vets. IAVA really started from nothing. Just an idea. In those first months, we were just a few frustrated vets working out of my cramped studio apartment. We had no money. No office. Just a website and a lot of passion. I think there were several small signs here and there along the way that reassured me this movement was growing. The biggest affirmation though came when the Post-9/11 GI Bill passed. I remember walking into our office that morning, hearing the news and just thinking to myself “Damn, welcome to the big leagues. There’s no turning back now.” It was a big milestone for us. Our small army of vets was able to bring leaders from both sides of the aisle together. We were effectively putting an entirely new generation of vets on the path to college. Teachers. Doctors. Maybe even a future President. To send every single Iraq and Afghanistan vet to college. Period. Over 2.2 million vets have served in Iraq and Afghanistan and another 150,000 are still deployed. Whether it’s tomorrow or a year from now, the country needs to be ready for the surge when these vets come home. To do this we need the support of every single American. If we can get the country to really rally behind our veterans and show them we’ve got their backs, then we can get them the resources they need for the transition home, ensure they can go to college on the GI Bill and put their leadership skills to use in the civilian workforce. I grew up in Garrison, New York. Just north of NYC. My dad was a foreman for Con Ed–and recently retired after 44 years on the job. My mom is a nurse. What college did you go to? What did you major in? I graduated from Amherst in 1998 with a B.A. in Political Science. My favorite teacher was a man named Austin Sarat. He was engaging, thought-provoking–and entertaining. Growing up in public schools in NY, I had rarely seen a teacher who could entertain and make learning really compelling. He did that. And along the way, really showed me what the Socratic method of teaching was all about. Staff Sgt. Sal Giunta, who just received the Medal of Honor, is an immediate standout for me. He’s a true American hero though he shies from the label. Only 25 years old he’s the embodiment of our country’s Next Greatest Generation. His selflessness, courage and integrity are an inspiration to every single man and woman who has served in Iraq and Afghanistan. Also, hands down Paul Buccha and Arnold Fisher–talk about two incredible patriots. Buccha saw some of the fiercest fighting of the Vietnam War and received the Medal of Honor for his service. He has been a formidable advocate for new veterans helping to erase the stigma of invisible wounds. He knows exactly what our generation of veterans is going through, and he talks openly about combat stress, only recently started PTSD counseling himself. As a Korea veteran, Arnold Fisher also knows firsthand supporting our troops doesn’t stop when they take off the uniform. Now, a successful businessman, he’s putting his money where his mouth is. No one else in the country has done more for wounded warriors than Fisher who’s helping veterans tackle traumatic brain injuries, PTSD, and other psychological issues head on at the National Intrepid Center of Excellence. These days, Congress could take a few cues from Fisher on how to cut through bureaucracy to get veterans and their families the resources they need when they need it. Ed Vick. Ed is a Vietnam veteran and, luckily for us, the chairman of our Board here at IAVA. As a former CEO and philanthropist, he’s given me a ton of support and advice as I’ve tried to build this movement from the ground up. And as a Vietnam vet, he knows exactly what new vets are going through when they get home. He’s also one of the original Mad Men. He’s an incredibly smart, strategic businessman from the advertising world and he knows exactly how to rally support and partnerships to build momentum for this movement. How is your life different now than it was before you started IAVA? I have a lot less free time. Everyone who works at IAVA is committed at an extremely high level. That means a lot of late nights, and long days. It means a ton of travel, and some serious physical demands. But in the end, it’s worth it. And it’s infinitely easier than what our troops are doing right now in Iraq and Afghanistan. I’ve actually met the President a couple of times now. Each time I emphasize to him that the war is off the radar for 99% of the American public. One in three troops are coming home today with invisible wounds like Traumatic Brain Injury, one in seven female veterans are screening positive for Military Sexual Trauma and thousands of service members are losing their medical records as they transition from the DoD to the VA health-care systems. When I saw him a few weeks ago at the signing of the repeal of “Don’t Ask Don’t Tell,” I simply said thank you. And that we were happy to be a part of this historic event. But if I had another minute, I’d ask him to help us make every single day Veterans Day. We need the President’s leadership to rally the country behind our troops and new veterans and their families to tackle these issues–not just on holidays. Specifically, we need his help in lowering the shockingly high military suicide rate. The stakes are high. People are literally dying on a regular basis. And we can’t waste any time. It defines everything we do today. Unlike a lot of the other veterans groups, we get social media. It’s a part of our organizational DNA. It is exactly where are members are. Everyday we’re connecting with them on Facebook and Twitter to drive the conversation on our issues and get a pulse on what’s impacting our community. We also built Community of Veterans, the first online social network exclusively for Iraq and Afghanistan veterans, to give them a private community where they could relate to other veterans who know exactly what they’re going through when they get home. Every single member of our staff is on Twitter. And I’m a bit of a Twitter addict myself (check us out at @PaulRieckhoff and @IAVA). But without it, I don’t know where we’d be. Raising money. We’re a small nonprofit, but it’s especially hard in this economy to keep the revenue flowing. Every day we’ve got to fight to keep the lights on so we can serve vets. Many folks assume that the VA takes care of everything, and Iraq and Afghanistan veterans are fully covered and served by the VA. They think we don’t need help–and we don’t need money. But that’s not the case. Nonprofits like ours play an essential, life-saving role. And we need help. Even five bucks makes a difference. You can donate here. Millions of vets are coming home, and we need your help to continue to serve them. When you’re 29 and just getting back from war, it’s hard to think of yourself as a veteran. I know I didn’t. In my head, I always looked to my grandfathers as the veterans–older, retired, white-haired guys who fought in World War II. It was an entirely new concept for me to embrace, and let me tell you it hasn’t been easy. There have been times when I’ve gone with other VSO leaders to the White House and I’ve looked around the Oval Office to find myself the youngest person there by 30 or more years. Every single Iraq and Afghanistan vet and their family would be successful. There would be no homeless vets. No unemployed vets. And definitely, no vets committing suicide. America would turn the page on Vietnam. And this generation of veterans, would be a generation of dynamic, strong, motivated leaders. We’d be on track to fully become the Next Greatest Generation. I’d love to coach the New York Giants. Or be the commissioner of the NFL. But I’d also be extremely happy teaching history and coaching football in a very small town in New York or Maine. I’d also love a shot at running the UFC (Ultimate Fighting Championship). I’m a huge fight fan, and firmly believe that UFC the most explosive sport in the world, and one of the most exciting businesses. I’ve also got the same haircut as the current CEO, Dana White. I think it’d be a lot of fun. Learn more about IAVA at iava.org.